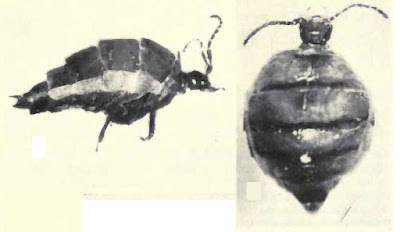 Lateral and dorsal views of Termitobia burgeoni, from Seevers (1957). The Termitopaediini is a group of physogastric staphylinid beetles found in association with fungus-culturing termites in Africa and southern Asia (Seevers 1957). Characters (from Seevers 1957): Maxillary acetabula moderately sized; galea and lacinia moderate in length, galea usually foliate and membranous; terminal antennal segments without coeloconic sensilla; mesocoxal acetabula large, shallow, faintly margined externally or not at all; broad mesosternal process rounded or angulate; middle coxae narrowly or moderately widely separated; hind coxae subtriangular, not produced beyond lateral articulation; metepimera obliquely truncated posteriorly, not prolonged beyond coxal articulation; tarsi 4, 5, 5-segmented.